Get your DAD what he REALLY wants for fathers day.!.!.!.!.!.!.!.! Maybe a new fishing rod or a tackle box or a gift card from Sea Isle Bait and Tackle is always a Winner. If you are a procrastinator we have the best hours around 5am – 9pm Friday and Saturday and 5-7 every other day of the week. The weather looks great for fathers day weekend so get good old dad and take him out fishing. There are still a couple of stripers in the surf some very nice flounder in the back bay (minnows are working great) or jump on the party boat and go get some sea bass. Happy fathers day from all of us at Sea Isle Bait and Tackle….. I am shore many of you have herd of Peyton Laricks and her fight with Congenital Diaphragmatic hernia (CDH) as a new born and her 88 days in CHOP in Philadelphia. Well she has grown up quite a bit in the pas couple of years and is doing great hear is a picture of her just the other day with a very nice flounder from the back bay of Sea Isle City fishing with her dad. For more information Pleas visit www.Peytonspromise.com and take a minute to read her hole story and if you can make a donation or join in one of the events to help us raise awareness of CDH and money for research that will hopefully one day help other babies fight this devastating birth defect. 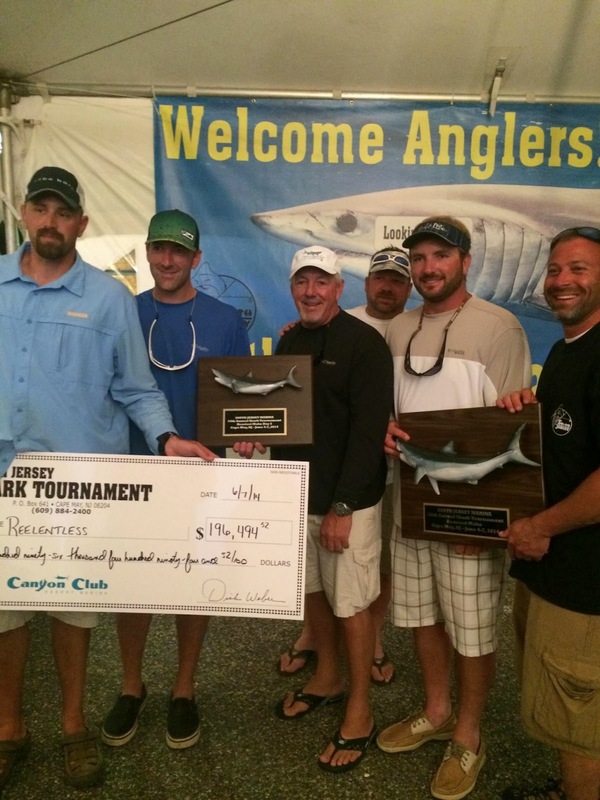 Sea Isle Bait and Tackle wants to Congratulations to Team Pirasea aboard the relentless for winning the South Jersey Shark Tournament with your 338 pound Mako. You guys did a hell of a job.